Follow Me.Christ's Gift: Mary our Mother - Follow Me. 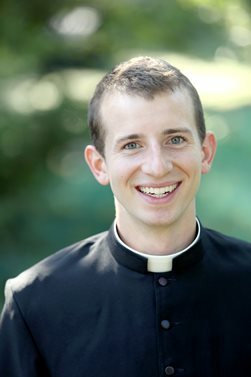 The following is an article written for our bi-monthly newsletter by Taylor Caputo, a seminarian for the Diocese of Peoria in his second year of pre-theology. As Catholics, we are typically brought up in a specific culture that gives Mary special emphasis, be it more or less the case. But, how much attention do or should we give her? Is Marian devotion something to keep, because she provides Catholics a sense of identity? Or, do Catholics see her role in the Bible as deserving of a little extra attention? These ideas are not wrong. But, as I was once taught by Fr. Louis Capporiccio, Mary is necessary for us! She is not merely a commodity. And, this is not to say God could not save humanity without her. But, it does acknowledge her necessity by reason of God’s willing to save humanity with her. Her role in bringing souls to heaven far exceeds that of any other creature. Jesus found Mary to be such a suitable helper, that He gave her to the disciple whom He loved moments before the end of His earthly life. Recall the words of Christ as he suffered on the cross, “Woman, behold your son.” Then to the disciple whom he loved, “behold your mother.” John stands in our stead; at the cross it is made explicit that mankind has a Mother in Mary. To borrow from St. Louis de Montfort, if a mother is fitting for the perils of this earthly journey, how much more necessary is a mother’s care on the way to heaven. It is most fitting that we have a heavenly Mother to raise, nurture, and guide us safely home. This spiritual mother is Mary. Christ’s gift to us demands a response. St. Louis de Montfort teaches there are many ways to give honor to Mary, but there exists a devotion that excels all in its perfection! He calls it “total consecration to Jesus through Mary.” The entire point of the consecration is to give of oneself completely to Jesus. The word consecrate means a setting apart to make holy. Consecration is not something new. The Baptized have already been handed over to Jesus in consecration. In consecrating oneself anew through Mary you freely renew the vows to be faithful to God that were made on your behalf in Baptism. Part of this devotion’s perfection consists in us giving ourselves to Jesus in the same way He chose to give Himself to us. Jesus’ coming to us through Mary shows His desire for us to return to Him through Mary. Mary has accompanied me throughout life, even before I recognized it. The Church where I was Baptized is dedicated to the Annunciation, and I received first communion at St. Mary’s. The Rosary was part of my first true spiritual devotion, and I attribute the most pivotal moment of my life to its grace. The event occurred on January 1st, the day I encountered Christ and the day the Church celebrates the solemnity of Mary the Mother of God. Still, my relationship to Mary, and in turn Jesus, would not be complete if I had not lovingly surrendered everything to her in return to give to Him. Finally, the orientation towards Christ resulting from total consecration benefits vocation. Who, if not Mary, responded perfectly to God’s call? To borrow another theme from St. Louis de Montfort, reaping a fruitful harvest of vocations will be one effect of cultivating Mary, “the tree of true life,” in our hearts. For more information on total consecration I recommend St. Louis de Montfort’s book: True Devotion and for the consecration itself Preparation for Total Consecration. Another version of the consecration is 33 Days to Morning Glory authored by Fr. Michael Gaitley, MIC.